History, Migration, Records, etc. has been quite a topic these days. I do enjoy reading when our well known Historians share their opinions and views through Print Media, Internets, Networking Sites, etc. etc. This entire hot History topic surfaced recently with one counter claiming the other and vice versa due to the Districthood Demand of Sadar Hills. I do believe that sticking on to Concrete History will be the best way to have a glimpse of our status at present. Recently, I have been reading lots of Opinions and Articles by our fellow Manipuri Naga Historians who tried their best to portray the position of ''Kukis''. I do accept their views about ''Kuki'' and their Write up History about ''Kuki''. But after reading all of these articles, a big BLANK dominates me. I donot understand what they actually mean by ''Kuki''. Even after spending hours of concentrating on the Carefully Drafted articles, I still couldn't make out what they actually meant by ''Kuki'' and who they actually meant by ''Kuki People''. Almost all the articles are so twisted that even the sentences counters the other one. Most of our Historians who finds pleasure in falselessly depicting a particular group might not be able to define themselves if i were to ask what they mean by ''Kuki'' and ''Kuki People''. It is therefore best to know what we are talking about when we are to empasize a particular Group. My purpose of writing this article is neither about Sadar Hills nor Naga History but for a Concrete View on Kuki History in Manipur and North East India based on Colonial Records and Regional Records of Kings or Maharajas. To be frank, I am not a Historian or a Researcher, but as a lover of Literature and a preserver of History, I do like to share my little knowledge of History which I know about. In Manipur, all of the three Major Ethnic Groups- Meiteis, Kacha Nagas aka Manipuri Nagas and Kukis migrated and settled in the Manipur Soil. None of these three groups were born in Manipur though the period of their migration and settlement can vary from one group to another. (Lalit, 1965, History of Manipur). Colonist writers who mostly wrote about Manipur divided the whole people into two main groups, Kuki and Naga. Tribes which shared the same linguistic group having the same linguistic roots etc were group under Kuki. On the other hand, tribes who have different linguistic roots and who cannot communicate within themselves in their own dialects were grouped under Naga (Dr Brown, Hill Country and Tribes of Manipur, 1820). In this regard Meiteis were categorised under Kuki owing to the Linguistic affinity with the other Kuki Groups. (Land and People of Indian States and Union Territories, SC Bhatt, Gopal Bhargava, 2001). History of Meiteis or Meiteilon becomes an essential point while dealing with the History of Kukis in Manipur. It is commonly an accepted fact that Kukis and Meiteis are different groups and different people. Yet the linguistic bond between these two groups always speaks about some unknown History which might have occured. Dr Gierson was the first colonial researcher to present the relationship between Meiteilon and Kuki-Chin Languages. He categorised Meiteilon as a Kuki-Chin Languages and many researchers followed his views. There are some opposition to Dr Giersion's works of classifying Meiteilon as a Kuki-Chin Language, the latest opposition being from Dr Irengbam Mohendra Singh. Though Dr Irengbam tried his best to oppose Dr Giersion's works, he still couldnot find an answer to some of the few facts which Dr Gierson presented about Meiteilon and Kuki-Chin Language. This particular relationship of Meiteilon and Kuki Languages leaves us some sort of Rational Clue about these two groups of People, Meiteis and Kukis. Sino Tibetan > Tibeto-Burman > Arakan Burmese > Kuki-Chin > Manipuri /Meithei / Meitei. Manipuri, popularly known as Meiteilon / Meithei is historically one of the sister languages of Kuki-Chin groups of Arakan Burmese branch of Tibeto-Burman sub-family of Sino-Tibetan family of Language. However, W. Ibohal Singh (1986) opines that old Manipuri, which was developed in 900 A.D., was a product of Pre historic Indo-Aryan and Tibeto-Burman of 800 A.D. Medieval Manipuri, which was developed in 1200 A.D., was again a product of Indo-Aryan and Old Manipuri (1000 A.D). Modern Manipuri (1600 A.D.) is the offshoot of Tibeto-Burman Kuki-Chin group and Medieval Manipuri. The above para which clearly depicts the relationship between Meiteilon and Kuki-Chin clearly speaks about the Historical and Social presence of Kukis in the Hill Country/ Hills of Manipur since time immemorial. Dr W Ibohal in his work clearly presented that Modern Meiteilon which was in use since 1600 AD was based on Medieval Meiteilon and Kuki-Chin Languages. In the views of a Linguist, Linguistic dominance can never occur in a short period of time. If Meiteilon could be a product of Medieval Meitei and Kuki-Chin, it would mean that the Kukis were very much present in Manipur much before 1600 AD. Taking Meiteis and Kukis into consideration, it would atleast take 200-300 years for one to dominate other or vice versa, not politically or socially but linguistically. Relationship, Social and Political Influence, Time Period etc are all an essential feature for a particular Linguistic group to fully adopt the other one. Therefore we can clearly conclude that Kukis were present in Manipur much before 1600 AD, contrary to some self-styled Naga Historians representing Kukis in Manipur as arriving by 1850. ''Kukis'' as recorded in the Royal Chronicles of Meitei and Tripura Kings. In the Cheitharol Kumbaba, we find that a Kuki by the name Taothingmang became the King of Manipur in 186 Skabda (264 AD). Again in 33 CE, two Kukis by the name Kuki Ahongba and Kuki Achouba were allies to the Nongba Lairen Pakhangba. King Irengba who reigned Manipur between 1107-1127 AD had contacts with Kuki Villages North of Imphal Valley. (Asim Roy, 1997). L Joychandra (Lost Kingdoms 1995:1), noted that Manipuri King Naofanga who reigned between 624 AD and 714 AD had Friendship Treaties with Kuki Chiefs East of Imphal. From all these above Historical and Linguistic Evidences it is ample clear that Kukis were present in Manipur as far as History is concerned. This fact contradicts most of our recent Naga Historians depiction of Kukis arriving as late as 1850. The fact that Col Johnstone recorded Kukis as spotted only around 1850's is not an issue to ponder about. Col Johnstone or any colonial writer never presented or reported that Kukis migrated into Manipur only around 1850. They only spoke about the year when they first came in contact with the Kukis. Had Col Johnstone or Higgins or Mc Cullock, arrived in Manipur in 1600, they would have reported the Kukis as spotted in 1600 AD. Captain Butler who in 1873 was Deputy Commissioner of Naga Hills in his Report to the Revenue Proceedings 1873, Nos, 120 to 132, mentioned Kacha Nagas as first spotted in 1839 as tribes living in the Jungly Hills due south of the Angami Country (Mc Kenzie, NE frontier of India). Col Johnstone in his report on ''Aggressions of Chassad Kookies'' mentioned '''the Tankhools are Manipur subjects and occupy the Hill country East of the Valley. They were first mentioned in Dr Brown's account of the Hill country and tribes under the rule of Manipur in 1867''. From all these above Historical accounts, we find that Kacha Nagas aka Manipuri Nagas too were spotted as late as 1860's. Colonial Writings clearly reveal the supremacy of Kukis over the Hill Country in Manipur. The whole of Present Ukhrul and Tamenglong districts traditionally and historically belongs to Kukis (Mc Kenzie,1884). The supremacy of Kukis over the Hills of Manipur have been carefully presented in Capt Brodie's accounts 1842. (Brodie's Tour, 1842, Mc Kenzie). In most of the Colonial Writings, we find limited informations on Manipuri Nagas. The word Naga has common occurence in any Colonial Writings but whenever we hunt for Informations on Tangkhuls or any other Kacha Nagas, we run out of Pages. This is simple proof that Tangkhuls or any other Kacha Nagas were not known much. Infact the whole of Kacha Naga/Manipuri Naga populace boomed out only after 1940's(G. Dey 1986:809). History of Manipuri Nagas in context of Manipuri Kings records depicts them as loyal subjects of Meitei Kings at the same time paying an annual tax ''Changseu'' to their Kuki Lords though their period of Slavery under Kukis in not clear. (History of Manipur, 1998 : 205). A Tangkhul friend once told me about Tangkhuls in the olden days. He told me that whenever they hear of Kuki Chiefs passing by they use to hide their pigs because if the Chief likes it he simply takes it and his Tangkhul subjects have to watch his actions. Such was the dominance of Kukis over the Hills of Manipur. Summing up all of these points based on Colonial Writings and Local Records, it is more than clear that Kukis were the sole rulers of the Hill Country. Their power mostly due to their neat administrative setup based on the complete authority of Chiefs. On the other hand, Head Hunting Nagas often fought among themselves which led to many Naga villages seeking refuge of Kuki Chiefs. (Mac Culloch, 1878). Tabloong or Naked = 30. Source: Assam Proceddings, 1854, A Mackenzie, Esq., Officiating Secretary to the Govt of Bengal, No-3150, dated Calcutta, the 19th August 1873. Therefore, we are now left to conclude that the Hills of Manipur except for Mao Dominance were all under the Kuki Chiefs and it belongs to the Kukis traditionally, culturally and historically. The 1993 massacre on innocent Kukis by armed Nagas are ample proof of Kuki dominance in the hills. If the Manipuri Nagas were so dominant they would never have bothered massacring innocent Kukis or someone lower than them that too, in the name of Christ. 1. Are Manipuri Nagas in position to question Kuki Ingenuity in the Hills of Manipur.? 2. Are Manipuri Nagas in a position to claim Traditional and Historical Lands of Kukis as rightfully theirs? If so on what historical grounds? 3. Did any Colonial writer ever depict Kukis as living in Naga territory? 4. 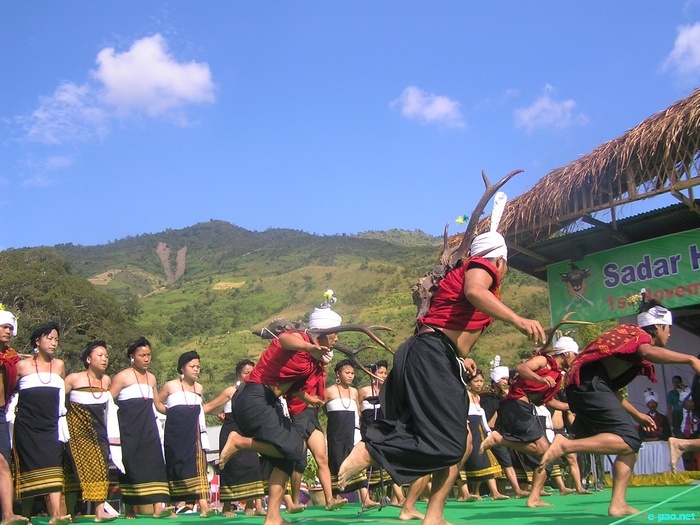 Which part of Hills in Manipur is traditionally of the Nagas? 5. Did Manipuri Nagas ever rule over the Kukis? 6. Colonial writers never pictured today's Manipuri Nagas as Naga. On what grounds are they Naga? 7. Who ruled over the hills till 1947? This article was posted on October 17, 2011.